The event that closes off the summer cultural events of the Cretan Association of Santorini “Arkadi” every year. Rakı is an anise-flavored alcoholic drink from grapes that is mostly drunk in Crete and the Cyclades. The popular Cretan singer Manolis Kontaros, with his lyra, and Vangelis Sigalas, with his violin, will sing and play until dawn, while everyone will dance and have fun drinking cold shots of raki. 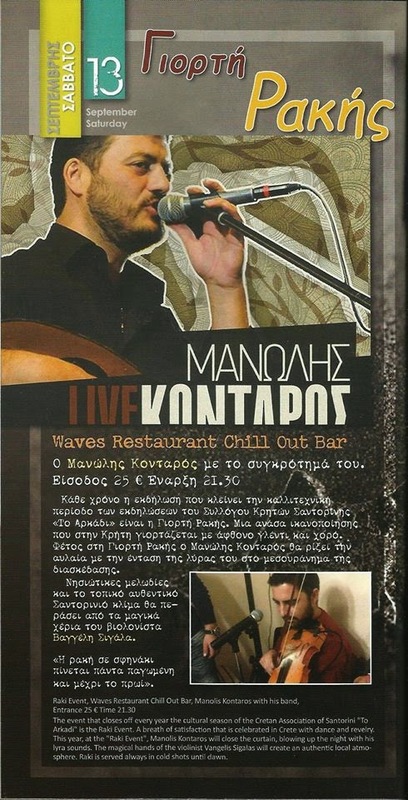 The celebration will talke place at Waves Chill Out beach bar in Perissa.